Among the shadows of the infamous Shudderwood lurk deadly beasts, savage madmen, and monsters that blur the line between the two. Into this fearful wilderness the heroes follow the path of the Whispering Way's nefarious necromancers. But when the cultists’ passage throws the forest’s tenuous peace into chaos, the adventurers find the only island of safety amid the savage wilds transformed into the killing grounds of a shapeshifting monster. Can the PCs escape the terror-plagued wilderness and unveil the death cultists’ true plot at last? Or will the lycanthropic curse claim them as well? 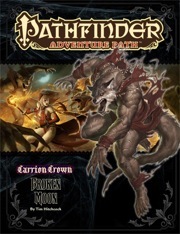 Each monthly full-color softcover 96-page Pathfinder Adventure Path volume contains an in-depth adventure scenario, stats for several new monsters, and support articles meant to give Game Masters additional material to expand their campaign. Pathfinder Adventure Path volumes use the Open Game License and work with both the Pathfinder RPG and the standard 3.5 fantasy RPG rules set. 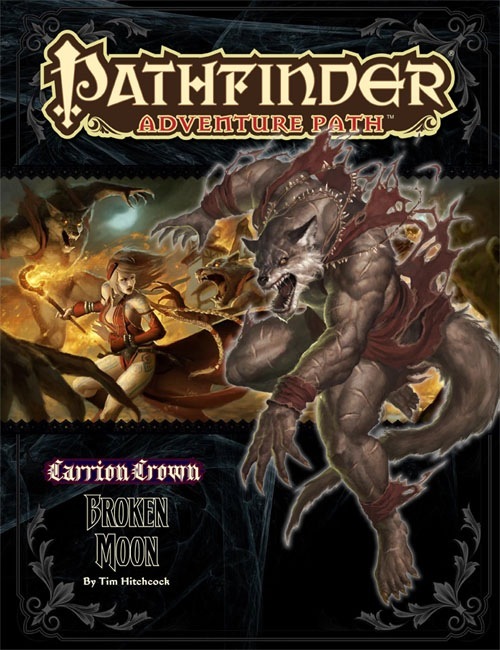 Broken Moon is sanctioned for use in Pathfinder Society Organized Play. The rules for running this Adventure Path and Chronicle sheet are available as a free download (561 KB zip/PDF). Its been awhile since I ran this, I recall prepping for this book not being all too excited about it but in play this module really shines. The majority of the adventure set in the Shudderwood provides a great opportunity for sandbox investigation, role play and of course a chance to go up against the beasts of the night. Likewise, Feldgrau with some tweaks makes a great end to the first half of the AP and a chance of course to avenge the party's mentor. In short, yes in reading this book doesn't leap out as a great volume but I think any group will be immensely rewarded through playing this one. Especially as the remaining modules in the campaign begin to diminish after this. Broken Moon or Are we still telling a story about the Whispering Way? The book is well written and solid in itself but only help to further push away the entire adventure path as is it now Wolfmans turn to check into hotel Transylvania. If taken as a module by itself with no connection to Carrion Crown storyline it is rather enjoyable but in connection to the Carrion Crown the threads that connect it are becoming so thin and frayed that they can barely be seen. It isn’t till the end that the game remembers what it is supposed to be telling and tosses in a random vision from a god that really doesn’t even seem to have much connection to the story at all in the first place. Good one off module, terrible adventure path module. The module is well written with a strong werewolf theme throughout. That's probably its main strength and its main weakness. It's a strong point in that it gives the story a very cohesive storyline by first discovering that not all werewolves are bad (but some are!) and second that there are many different clans and it might be necessary to start an alliance with some of them. The low point is that it can be tiring for a group to be constantly killing the same kind of enemy with minimal variations. I can see how my group would get bored after a while. Another observation is that the enemies in the module are somewhat weak. Most of the encounters are CR6 to CR7 in the first part. In the latter sections, it can be up to CR9 - at a time when the PCs will have reached level 8 already. A normal party would not have a particularly difficult time going through this adventure so I'd consider this module as easy-ish. This can be made much worse if a ranger PC chooses humanoid (human) as their favored enemy, since their bonus will obliterate any werewolf enemy. The same thing goes if there is a cleric in the party, since all the undead encounters will be much easier. Having both a cleric and a human-hating ranger can be game over. Consider this before you even start. Another negative point of the module is that the big enemy is always acting in the shadows. Nobody suspects who he is or even what his name is. Then, all of a sudden he appears and the PCs need to kill him off. There's no foreshadowing or even a mention to his name. That's a wasted opportunity as well, in my opinion. Overall, it's a very solid module, dampened by the fact that the enemies are repetitive and the main enemy was dumped on to the players as a surprise. A really fun adventure all the way through, though unfortunately my party actually got stuck on this one for a bit, and needed some coddling. Like the last book, the final battle is a huge let down, and very poorly designed. This actually would have been the end of my game, as the boss has a DC 21 save or die, and everyone in the party failed but the ranger. I ruled it to put the party at -1 and dying instead and ran the battle as is. After loosing 2 party members(half the party) the other half did manage to beat him still. It was just such a poorly designed encounter that's sole purpose is to insta-kill PC's. After that we all lost heart on the series (technically the only person who made it without fudging was the animal companion) and we dropped the campaign. He Could easily end the whole campaign with 1-2 save or dies he has, and after he burns through those he has nothing else left. I highly recommend rewriting the final battle of this campaign to be more thematic. P.S. My game is a 25 point build with bonus powers and all players are power gamers. The guy with the best chance only had a 40% chance of making the save. P.S.S. I have recently thought about bringing this game back. When I started talking about it with a buddy it just made me so sad to think about I decided to can it. May run book 4-6 (already have everything in map tools) when it becomes sanctioned for PFS. Just started running this for my players, it's ok, but not as long as the other scenarios, if it get's as long, it could quickly start to get boring. But it's good with a more roleplaying oriented scenario. The problem is the difficulty. The players just came from Caromarcs castle, where they battled a CR 11 (more like 12-13), with help from a CR 13, clearly designed not to be able to do damage to the CR 11 at all. Really really hard battle, and that after taking on one hard battle after another, on top of small bridges 150 ft over raging waterfalls. Several traps, golems, basilisk and a black pudding. The highest CR in Broken moon the highest CR encounter is 10, the end boss, after that it's CR 8. Those that are CR 8 most have NPC levels. As such, the same PC's who lived through the horror of the last scenario, have no battle challenge in this one. NPC levels are not equal to CR -2 at all! Good with a roleplaying scenario, but have to up the difficulty of ALL encounters. When do Paizo learn that 4 CR 3 doesn't equal CR 7, at most CR 5, even then it's high. CR 3's to 7 would be something like 12-16 CR 3 to a CR 7 encounter. I like the werewolf chick. I am incredibly pleased to see this. I love me some lycanthropes, so to see an adventure that features them quite heavily, and a support article to boot tickles me to no end. I like werewolves and the plot sounds cool. So, does Golarion's moon have a name other than "the moon"? And if so, what is it? So far, we've only called it "the moon." it'll probably be called Somal. in fact, we may have already done this somewhere in print. Mark (Yoda) can we get a ruling on this? Does it need a name? Our own moon doesn't have a name either except for the word "moon" in various languages. Isn't our moon named Luna? Or is that just "moon" in Latin? "Luna" is indeed "moon" in Latin. In Greek, it's "Selene", another name, sometimes bandied around, but it's just another word for "moon" as well. And an article on the werewolves of Golarion? Ooh, I'll have to get this book just for that alone. I had an abject fear of werewolves when I was a child. So that's a negatory from me. I also had a fear of large spiders, and at times I still do. Tim Hitchock told me that this adventure would turn me into a puddle whimpering of goo. With raving animals and lunatics, I find it apt that Hitch wrote this chapter. I name you both Werewolves! I see my reputation as the Werewolf in "Are You a Werewolf" precedes me. I don't know why but every time I see the title for this my mind goes to Broke Back Moon. Talk about a totally different take on a adventure about werewolves. Does it make any sense for a groupe of players to start with this part ? Could my group only play this part of the AP and still understand something ? I don't really want to buy the whole Carrion Crown AP (I am leading a Planescape campaign with Pathfinder's rules... and I am still looking for players for RotRL, CotCT, LoF and KM...) but I am very interested by this issue, with the werewolves + the Whispering Way. Even more different, when I read your post I first read Brokeback Mountain. Hmm... that could be fun for a comedy-adventure. I was kinda curious if anyone got my Bob reference from earlier. Not I, but now I'm curious. Obviously it's difficult to tell without actually having the book yet, but normally it's possible to put a bit of work into it and make it work as a stand alone. My impression from the blurbs of the ap is that it is going to have at least some element of 'follow clues left by cultists ( not choruses stupid iPad!) to reach adventure area, get involved &deal with problem, find clues to next bit' - if that's accurate then you can probably pop the intro clues into your story, and either remove or modify the clues that point to Illsmarch. I suppose you could make it work as a solo adventure without too much difficulty, but man- the other adventures in the series are so awesome that I can't possibly see leaving them out of the mix. Wait--- you mean I wasn't supposed to add the savage love scene? Phew--- I thought I'd gotten that right. You had me nervous for a second. I thought perhaps I'd gone over the top or something. I got it, but wish I didn't. Oh good I was starting to wonder if I was the only person who had seen that movie. "When the savage lord of Ustalav’s werewolves is mysteriously murdered"
That first sentence needs some minor attention. When do we get to see the final cover? The product image and description have been updated to match the finished product. That is a nice werewolf ...and poor Seoni...Weird I just thought of little red ridinghood but with seoni and a werewolf. Can't wait to play this adventure then get to read it cover to cover after Tim! I also love that the write up is not just on Werewolves but all lycanthropes. The secrets of the Whispering Way is what's the most interesting. I'm sitting here in the dark, covered with rats, wondering if I should run this one for you Baron, as I deliberately placed every one of your phobias, fears, and insecurities into this adventure. seriously, I'm covered with rats . Someone's been reading The Rats in the Walls by H.P.Lovecraft too often. So what, you're the boss now? You're the King of Bob?